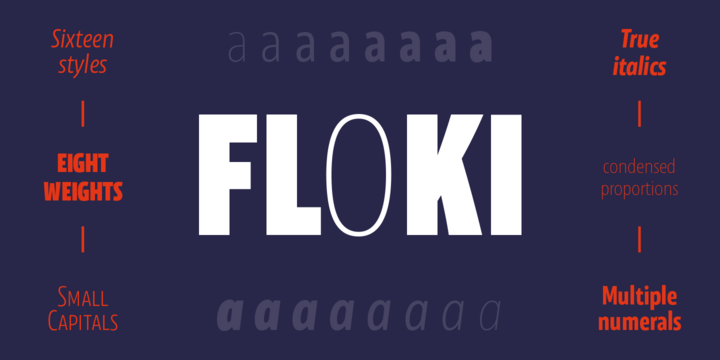 Floki is a contemporary sans serif typeface created by Teo Tuominem and published by LetterMarker which it comes in 8 weights (from XLight to XBold) matching italics, useful OpenType features (Oldstyle figures, Numerators, Tabular figures, Lining figures, Small Caps, Denominators etc.) and language support. This condensed typeface has a humanist touch but also it has a flavour of geometry. It was designad to be suitable for typography use, editorial design, packaging, branding etc. Have fun! Price: starting from $39,90 for one font to $498,00 for all 16 fonts. A font description published on Tuesday, October 24th, 2017 in LetterMarker, Teo Tuominem by Alexandra that has 647 views.